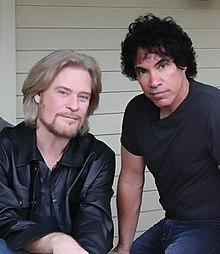 Hall & Oates is an American musical group. The members are Daryl Hall and John Oates. They came from Philadelphia. Their greatest fame was from the late 1970s to mid 1980s. During this time they had many hit songs. They faded from view in 1990, but the duo are still performing together. This page was last changed on 13 June 2018, at 02:53.